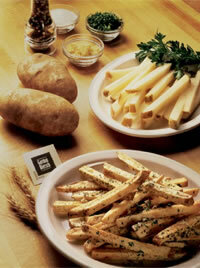 Preparation and Care for Perfect Idaho® Potatoes! If you are relatively new to food preparation, or have cooked for some time and want a quick refresher, or as an accomplished chef/instructor are looking for teaching tools… Potato.101 is a source you’ll want to examine NOW and keep for the future. 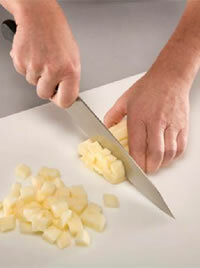 Potato 101 is perfect as an easy-to-follow educational program and reference guide. It provides a base understanding of potatoes, starting with their history in Idaho, why the soil, water and climate combine perfectly in Idaho to make their quality outstanding. You’ll learn about the health and nutrition aspects for potatoes as well as its economical cost and versatility on menus. The program continues with instructions in the proper holding, storing, handling, cleaning, preparing and serving of Idaho potatoes. Each technique is described in detail and supported by visual graphics and a short video demonstration. Whether your goal is to cook a simple meal or to create a culinary masterpiece, understanding Potato.101’s basics is your first step to success. Do you know the correct way to store Idaho® Potatoes? Do you know the correct way to prepare the perfect Baked Idaho® Potato?